Award-winning jewelry designed and created by father-daughter team, Randall and Brandy Hurt, available at AVA Goldworks in Hannibal, MO. 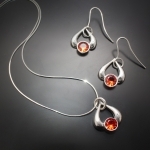 Since competing in our first jewelry design competition in 2005, we have been honored to win over 40 awards. These awards are judged based on design, craftsmanship, and ease of wear. Please enjoy looking through our award winning designs. Hand Fabricated Platinum and 18K Green Gold ring set with a trilliant cut natural Blue Sapphire and adorned with 94 round cut Diamonds. Gent’s 14K Red & White Gold ring set with a Tourmaline, two Brown Diamonds and two white Diamonds, all round cut. 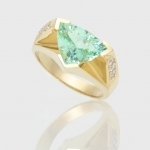 Gent’s 10K Gold ring set with a 14mm square cut Turquoise. Cultured Pearl necklace, featuring a reversible hand fabricated 18K White Gold pendant, showcasing round Diamonds and oval Opal on one side, and 18K Rose Gold with Pink Coral and diamonds on the reverse side. 18K Green Gold ring set with a cushion cut Yellow Beryl and six round Yellow Diamonds. Hand formed bracelet from cold-rolled Palladium bar stock, embellished with 24K Yellow Gold wire, set with three Tahitian Pearls. Hand Fabricated 18K Yellow Gold and Palladium Gent’s ring set with a natural emerald cut Orange Sapphire and adorned with 16 round Diamonds. Hand Fabricated 14K Yellow Gold and Palladium earrings set with Green Tourmalines, Garnets, and Sunset Tourmalines, all trilliant cut, and adorned with 20 round Diamonds. Ring cast in Palladium from a hand carved wax and overlaid with Hand Fabricated Platinum plates & tubes. 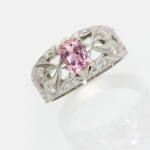 Set with a natural color-change oval Star Sapphire, Diamonds, and natural Alexandrites. 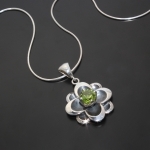 The Star Sapphire changes from a faint purple in incandescent light to a green cast grey in sunlight. 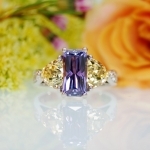 The Alexandrites exhibit a natural color change as well, from teal to purple. 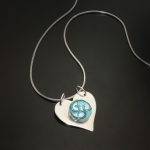 We were honored to win a 1st place award in the Bridal division for this necklace. The AGTA Spectrum Awards is considered the most respected and prestigious creative award for the jewelry design industry. Hand Fabricated 14K White Gold hinged pendant set with a Black Opal to represent the Earth, a Sphene set in 18K Yellow Gold represents the sun, a moonstone for the moon & accented with White Diamond stars & Yellow Diamond accents, all hanging from a strand of graduated Tahitian Pearls. Hand Fabricated 18K Yellow Gold and Palladium necklace set with a Madeira Citrine and featuring hand formed chain at back. 14K White Gold Hand Fabricated enhancer pendant set with a radiant cut Aquamarine, two round Danburite and accented by round Diamonds. The back of the enhancer opens to allow the piece to be worn on Pearls. 14K Rose Gold & Platinum ring, Hand Fabricated with round wire featuring a floral design, set with a Pink Spinel and six round Diamonds. Hand Fabricated Platinum ring set with a trilliant cut natural Sapphire & accented by marquise and round cut Diamonds. “The Earth is our Pearl” went on to compete in the National competition and won in Category III. 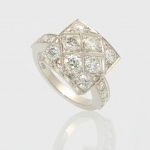 Hand Fabricated Platinum ring set with a 1.15 ct. round Diamond center, flanked by two pear cut Diamonds totaling .59 ct., and surrounded by thirty-six round diamonds that total 1.25 ct. The total diamond weight is 2.99 cts. 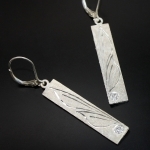 Hand Fabricated Palladium necklace & earring featuring more than 8 cts. of trilliant cut Aquamarines and over 1 ct. of round Diamonds. Hand Fabricated 14K White and 18K Yellow Gold stick pin featuring a natural Ruby and five Tsavorite Garnets set in Sterling Silver tubes. The Pearl is removable and when worn, the fish looks like it’s chasing the pearl. This beautiful set went on to compete nationally and won the top award, plus was voted as the favorite among attendees. This adorable fish pin also went on to compete nationally and won a 2nd Place Award. Jewelry designers across the country were invited to put their skills to the “ultimate” test in a unique jewelry design competition from Instore and The Smart Jewelry Show. The contest had two categories, pieces made by hand with a hand drawn rendering, and pieces designed by computer and carved by a CAD/CAM machine. 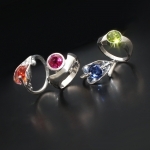 The contest involved submitting a design of a lady’s ring using one of two gemstone, provided by the magazine. Twelve finalists then created their design and the competition was judged down to the top four finalists. The final four were then displayed and judged at the Smart Show in Chicago. 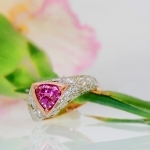 This rose gold ring set with the cushion cut Rhodolite Garnet was the winner in the Hand Rendering division. 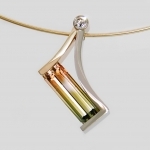 Hand Fabricated Palladium and 14K Green Gold necklace set with a triangle cut Oro Verde. Hand Fabricated Sterling Silver lily necklace with 14K White and Rose gold accents and spadix consisting of 49 Pearls. 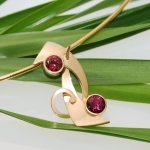 Hand Fabricated 14K Yellow Gold & Palladium necklace featuring a round natural Pink Sapphire. 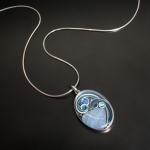 Hand Fabricated Palladium enhancer pendant set with a oval cabochon cut 19.43 ct. Aquamarine and accented by a pearl & 2.52 cttw of round Diamonds. 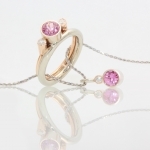 The enhancer opens to allow it to be worn on Pearls or a chain. Hand Fabricated oxidized Sterling Silver earrings with 14K White and Rose Gold accents. 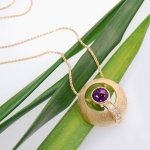 Hand Fabricated pendant set with a 3.03 ct. trilliant cut Beryl, creating a lovely reflection effect. AVA Goldworks is a small, family business located in Hannibal, Missouri, operated by Randall Hurt, his wife Debbie, & their daughter Brandy. The store opened in Downtown Hannibal, just a stone’s throw from the Mississippi River, in December of 2004. Hannibal is a great small town across the river from Quincy, IL, & located within two hours drive of Springfield, IL, Saint Louis, & Columbia, MO. The journey to where they are today started over 40 years ago when Randall & Debbie were newlyweds. 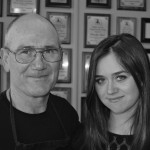 In 1973, Randall became a jeweler’s apprentice in a busy trade shop. He worked hard to learn everything he could about creating jewelry. He would often practice french setting stones in nickels at home at the dinner table. He was determined to master the art of jewelry making. After apprenticing for 6 years, the family moved around the country as Randall worked for various jewelry stores as their bench jeweler. He continued to learn new skills & techniques at each store. In 2000, after 27 years of mastering his trade, he passed the rigorous test to become a Jewelers of America Certified Master Bench Jeweler. Of the four levels of certification, Certified Master Bench Jeweler is the highest & there are currently only 133 people in the nation who have passed the test. After 30 years of Randall working in the jewelry industry, the family eventually decided to open a store of their own, with the desire to create & provide quality jewelry in America’s hometown. The store is a rarity in today’s market, actually creating the product they sell. Brandy & Randall design & create the jewelry that glitters in the showcases. 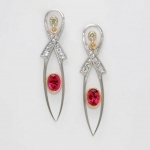 Brandy has become an accomplished designer, winning her first jewelry design award in 2005 at the age of 19. Since then, Brandy & Randall have gone on to win over 40 jewelry design awards. 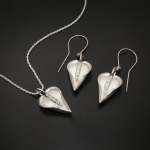 After slowly building their business with an emphasis on Gold, Platinum & Palladium jewelry, they recently began creating Sterling Silver AVA Originals as well. 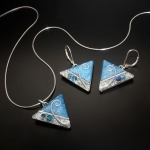 Brandy creates most of the sterling silver jewelry and brings her years of jewelry design to a new medium. 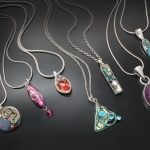 The silver jewelry brings together fun designs and colorful gemstone combinations. 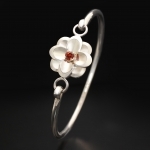 Now, customers can get a special piece, whatever their budget, in the store as well as online. AVA Goldworks is also a accredited member of the Better Business Bureau since November of 2005 with an A+ rating as well as members of Jewelers of America since January of 2005.